Dylan Hartley was left with a ‘hollow feeling’ after a season of hard work went to waste for Saints on Saturday. Jim Mallinder’s men were beaten 29-24 by Saracens in the Aviva Premiership play-off semi-final at Franklin’s Gardens. It meant topping the regular-season table for the first time counted for little, with fourth-placed Sarries heading to Twickenham to face Bath in Saturday’s grand final. And though Hartley was proud of the consistency his team had shown in securing a place the summit, he was left ruing their failure to set up a shot at back-to-back titles. “It’s a hollow feeling, a season’s worth of work down the toilet in 80 minutes,” said the skipper. “I don’t think we played poorly. 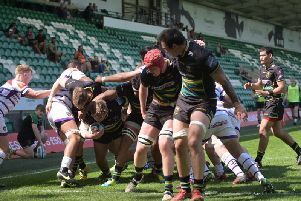 Saracens were very good on the day, they took their opportunities and we missed out on a few. “Our discipline gave them easy three points here and there and they were able to build on that. “Overall, it’s frustrating but I don’t want to take the gloss off a good season. “But I don’t want to take the accolade of coming first in the league because it’s nothing. “Winning at Twickenham this weekend is what everyone wanted and what counts.